Movie Churches: It's Vampire Movie Month! Nowadays, if you’re making a vampire movie, you have to decide what you’re going to do with the Cross. This was not the case when vampires first appeared in fiction. The first great vampire literary sensation was Varney the Vampire by James Malcolm Rymer, which appeared first appeared in penny dreadfuls and then in proper book form in 1847. Varney had no problem with crosses -- or sunlight or garlic, for that matter. 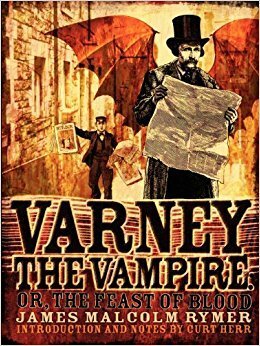 Fictional vampires had to start worrying about crosses when Bram Stoker came along with the novel Dracula in 1897. 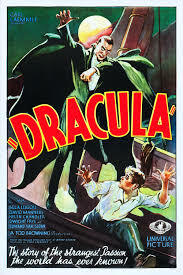 The idea of the cross as a weapon against vampires really took root in the public consciousness in Universal Studios’ 1931 adaptation of the novel. The image of a vampire cowering at the upheld cross became a staple throughout Universal’s horror franchises in the ‘30’s and 40’s and continued in the Hammer Studio horror films of the ‘50’s and ‘60’s. 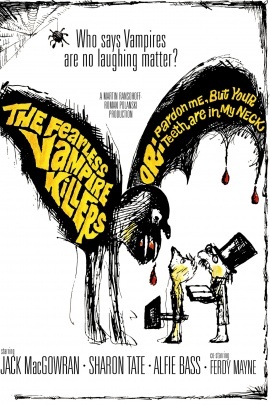 The trope was challenged in Roman Polanski’s 1967 film, The Fearless Vampire Killers (aka Dance of the Vampires and Pardon Me But Your Teeth Are In My Neck). In that film, a Jewish man who turns into a vampire scoffs when a cross is held before him. Since then, writers have had to choose whether crosses harm their vampires. In Joss Whedon’s televised vampire world (Buffy the Vampire Slayer and Angel), the cross is injurious to vamps, but no explanation is given. In the world of Stephenie Meyer’s Twilight, her glittery creatures aren’t harmed by crosses (or sunlight).. but to be fair, those aren’t real vampires any more than her books are real literature. Anyway, this month in Movie Churches, you can find out how the Church and members of the clergy are presented in vampire films. It’s been said that the horror genre can be more religious than other genres because it takes the supernatural as a given -- and the vampire subgenre has to deal, somehow, with the Christian faith. Even the few science fiction vampires which are presented with a non-supernatural explanation, but they still end up dealing with the Cross, if only to say that crosses won’t work against them as a weapon. Crosses do work in some of the films we’ll be watching in the weeks to come (for example Van Helsing and From Dusk to Dawn) and others they don’t (John Carpenter's Vampires). But creators of vampire literature aren’t the only ones who need to figure out what to do with the Cross. We all do. As the Apostle Paul wrote in I Corinthians 1:18, “For the word of the cross is foolishness to those who are perishing, but to us who are being saved it is the power of God.” You might not have to decide whether the cross will destroy vampires, but we all need to decide whether the cross will save us.